Trinity blend is a beautiful blend from two famous coffee growing regions. Coffee beans from Brazil in this blend gives a nutty flavour and the beans from Guatemala makes the coffee sweet and a little chocolatey. Our Trinity Blend is carefully harvested, medium roasted and week rested to develop good body and packed with full of freshness and flavour. Our blend is specially designed for the espresso machine. The result is every cup has freshly carefully ground coffee which goes in our machine giving a consistent same flavour in every cup. The taste is one you will remember and with its flavour. Trinity blend is a stunning blend we think so anyway. Medium roasted coffee beans to ensure all the sweetness yet good enough to enjoy this blend with milk. Our blend is designed with just two beans to give our beautiful Cappuccinos and Lattes real chocolatey notes. In every espresso you get a hints of sweetness followed by nutty notes that makes our blend so special. We are passionate about looking after our customers. We make sure every cup has true magical flavour of the coffee bean. 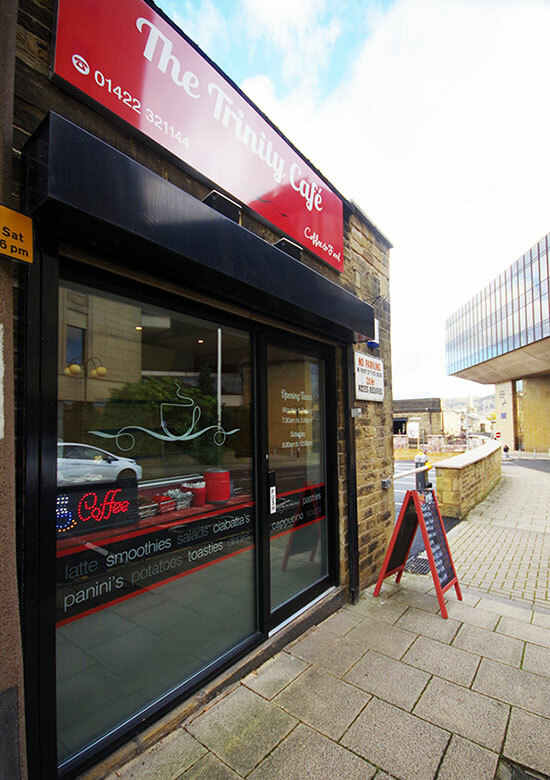 Our staff will always give you a warm welcome in a friendly atmosphere at THE TRINITY CAFÉ. We offer a wide selection of catering packages to suit your budgets. We are pleased to personally refine options or meet your dietary requirements (subject to price & availability). We also provide desserts including egg free cakes for your event. We specialise in providing a range of Indian snacks and curries (vegetarian & non vegetarian). Our Indian snacks and currys are a clever use of different spices blended with together with other ingredients to bring out the authentic traditional taste in this food. It reminds of childhood memories watching Mum making them with such subtlety, precision and care in preparation and appreciation of love in cooking these snacks and remarkable dishes. Sometimes Indian food is described as spicy, hot or mild. But we know how to make the contents and tastes come through. The food we serve is very tasty. Surprisingly pleasant. Lightly textured. Moderately spiced and aromatic. All our snacks and currys are freshly prepared, cooked with love and passion so why not come to our Trinity Café and try it! Welcome to the Trinity Café where we serve the best hot and cold sandwiches, paninis, ciabattas, jacket potato, salad, melts, snacks and confectionary. We have a range of hot and cold drinks including speciality coffees and teas. Our delicious sandwiches are made from carefully selected fillings made with freshly baked white/brown breads. If you are looking for something different to the usual then come into the Trinity Café and try our special Indian snacks & currys. Simply mouthwatering! We do offer Call & Collect Service. Just dial 01422 321144 if you are in meetings or travelling and tell us your exacts needs and when you would like it and it will be waiting for you. You can pre-order lunch any time or pop in and order in the morning while purchasing a coffee or hot drink. We will have your food ready and waiting to collect at lunchtime.